DESCRIPTION Situated on the edge of Billingshurst High Street with very good access to all of its amenities and shopping facilities. Billingshurst railway station and local schools are also easily accessible. The property itself is a spacious two bedroom ground floor apartment forming part of this centrally located block with a secure parking space. The property itself has a good sized living room, two double bedrooms, a spacious bathroom with shower and separate bath. The kitchen is well fitted and has integrated oven and hob. The apartment also benefits from double glazed windows and gas fired heating to radiators. LIVING ROOM Two double glazed sash style windows, coved ceiling, two central ceiling roses, TV point with point giving access to communal Sky dish, telephone point, and radiator. KITCHEN Comprising: worksurface with inset one and a half bowl single drainer stainless steel sink unit with mixer tap having base cupboards under, space and plumbing for washing machine and slim-line dishwasher, further matching work surface with inset four ring gas hob having integrated oven beneath with base cupboards and drawers, retractable larder unit, space for tall fridge/freezer, further matching work surface with base cupboards and drawers beneath, range of matching eye-level units, stainless steel extractor hood over hob, gas fired boiler, double glazed sash style window, coved ceiling, radiator. BEDROOM ONE Fitted wardrobes, radiator, double glazed sash style window, coved ceiling. BEDROOM TWO Radiator, double glazed sash style window, coved ceiling. 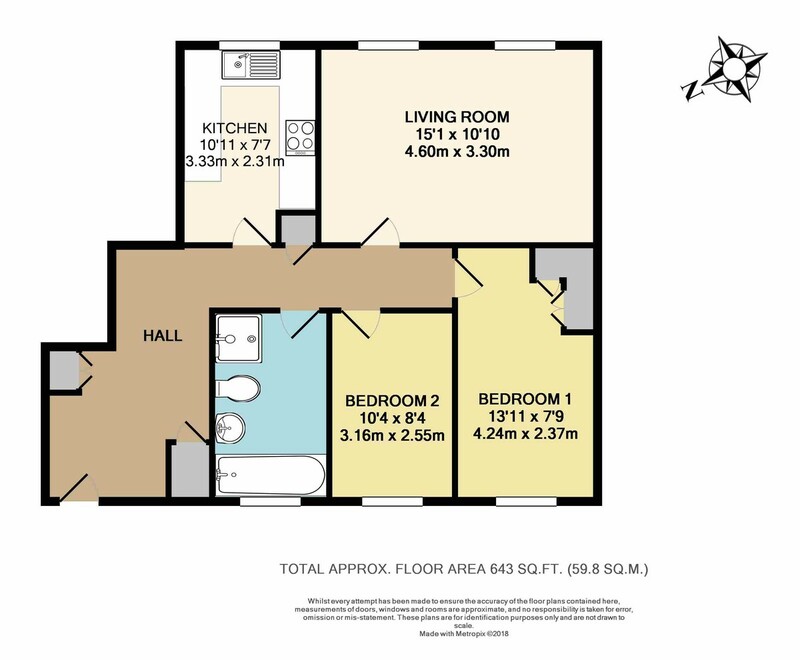 BATHROOM Fitted with a white suite and white ceramics and tiled floor, panelled bath with mixer tap and hand held shower attachment, tiled shower cubicle with mixer shower, wash hand basin with storage under, radiator, coved ceiling, double glazed window. SECURED PARKING Approached via a remotely operated wrought iron gate is an area of residents parking with this property having a personal parking space. GARDENS Communal gardens surround the development with a well managed area of lawn to the rear with flower and shrub borders, seating area and a communal washing line.